Join the Geneva Historical Society for a day trip to the state capital! Empire State Plaza Albany (NY) July 2015 by Ron Cogswell. CC by 2.0. 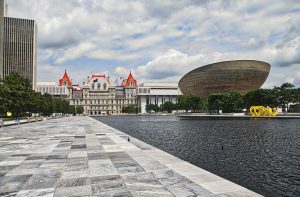 Time will be spent entirely at the Empire State Plaza. The day will begin with a visit to the New York State Museum. In addition to the museum’s ongoing exhibits, see the special exhibit Votes for Women: Celebrating New York’s Suffrage Centennial. For lunch bring a bag lunch or purchase food at the Concourse. After lunch visit the Corning Tower and head to the 42nd floor for a view of Albany and the surrounding area. The day will end with a guided tour of the New State Capital. Dinner will be at the Spaghetti Warehouse in Syracuse. The cost is $89 per person and includes motor coach transportation, tour manager, all admissions and driver’s gratuity. A $49 deposit is due by September 27, 2017 with the final payment due by October 15, 2017. Make checks payable to: 1st Choice Educational Tours. The bus will leave from the Town and Country Plaza on December 5 at 7 a.m. and will turn to Geneva around 9 p.m. A minimum number of participants are required for the trip to run and seating is limited. For more information or reservations, contact Kerry Lippincott at 315-789-5151 or director@genevahistoricalsociety.com.